It’s been cold lately in Kentucky. We’ve had some 15 degree nights, a couple of inches of snow, and enough wind to make us feel much colder. Yes, we enjoyed a wonderfully warm October (NPR says it was the world’s warmest in recorded history), but that now seems so past tense. Five weeks to go in Campbellsville, and by Louisiana standards, them’s gonna be five weeks of winter. This serious cold has made me cogitate a bit on Wind Chill Factor. I had always thought it only applied to living things, not machines or structures. For example, if your car’s antifreeze is good to 15 degrees, there’s no way a 20 degree night with a 30 mph wind can bust its radiator, which is absolutely true. But if you are inside an aluminum travel trailer, a 30 mph wind will take away its internal heat about as fast as a 15 degree lower temp. Just sayin’, it gets cold fast in an Airstream when it’s cold and the air outside is really moving. When it’s this cold nobody wants to go out, or go anywhere. So I try new recipes and try to keep old Pink from becoming too bored. She has, for a dog, a first-rate mind. And I can tell when she’s bored: she wants to walk far too frequently for her biological needs and whines for me to set up the screen door so she can see out. It’s a sad thing, it really is. I hate feeling cold; Pink hates boredom. So we compromise. We walk more frequently, but we spend no minutes looking out the screen door. A couple of days ago I caught Kroger offering 5 ounces of fresh, beautiful raspberries for 99 cents. I love me some raspberries, but as they’re usually $15 a pound or so, I haven’t had much occasion to use them. 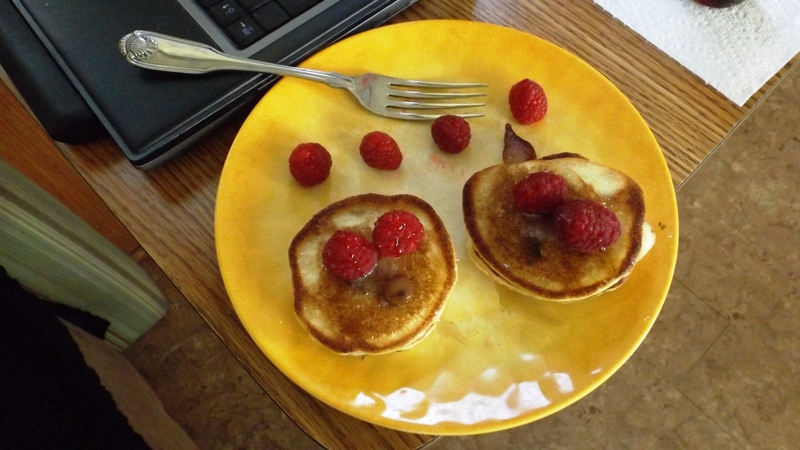 Epicurious offered a recipe for pancakes with chocolate chips and fresh raspberries. I’m too lazy to cook pancakes from scratch, so we made do with the Bisquik pancake recipe, and threw in some Ghirardelli Milk Chocolate Chips. I topped the ‘cakes with butter, raspberries, more Ghirardelli’s, and Log Cabin syrup. Holy Moly! That stuff is good enough for dessert! Those recipes look, and sound yummy. Potato soup is a great idea, and those raspberries are gorgeous. How about an immersion blender? It is a very sturdy unit, and it breaks down into two pieces. My kitchen may not be as small as yours, but it is tiny, and with limited storage, so I’m always looking for ways to maximize the space. October was the usual mixed weather bag up here in the mountains. We even got a light snow during the month (and another one this month). Right now, this area is under an ice alert. Temps today have ranged from 10ºF this morning to about 32ºF now, with it being icy all day. If you’re not already in them, it sounds like time for the long johns. We ain’t got none left, unless I throw out some clothes. Totally agree with KD on the immersion blender. We have been using the same Braun model for years, and it’s still going strong. My husband calls it the “boat motor”. We even took it to Belize and back with us, that’s how much we love it. It’s absolutely perfect for pureeing soups! Your soup and pancakes look delicious! Ha ha. Know just what you mean. Very little space here at this small house. ONE trailer is tough enough. The cakes were superb, and they would be even better made in your kitchen. Go for it! A Coleman stove on a picnic table is bigger than ours!